We’re now less than a month away from the return of Star Wars Rebels to Disney XD on September 24th, making this the perfect time to revisit this past season. Fortunately, the second season of Star Wars Rebels hits blu-ray this week. The box set offers fans the opportunity to relive the season in the highest quality available, though fans looking for bonus features may be disappointed. Season Two of Rebels picks up where Season One, with our heroes still flying high after their defeat of the Grand Inquisitor, while embarrassing Grand Moff Tarkin and meeting Ahsoka Tano in the process. The season opened with a bang, a showdown between Kanan, Ezra, and Darth Vader, while Ahsoka was forced to confront an unfortunate truth. The season refocused after that, showing the growing pains of the Rebellion (finding a suitable planet for a base, gaining new resources and allies, etc. ), all the while the confrontation Star Wars animation fans had been anticipating since 2008 loomed. While I would argue the shadow of Vader and Ahsoka’s showdown loomed a bit too large over the rest of the season, I do feel the ability to binge watch this season increased my enjoyment of it. Where the story of Season One was well suited to having a separate adventures that built on each other week after week, the connections Season Two episodes were subtler. Having a week between each episode, as well as month long hiatuses and new Star Wars movie in the theater, made it hard to appreciate the big picture at times. Watching the episodes in quick succession, I was able to better appreciate the way the Rebel fleet grew and evolved over the course of the Season. Establishing their base at the end of the Season felt random when the Season first aired, but upon a rewatch it felt earned and like something they had been building towards all season. Unfortunately, I found the Bonus Features on the box set to be a bit lacking. There are three main offerings, “Connecting the Galaxy: Rebels Season 2”, “From Apprentice to Adversary: Vader vs. Ahsoka” (blu-ray exclusive), and all twenty episodes of “Rebels Recon”. While each of these is cool in their own way, I feel there is a missed opportunity to really go in depth on the behind the scenes process of the making of Rebels. “Rebels Recon” gives us some of that, however those have been available (for free) on StarWars.com since the episodes aired. A more in depth look into the development of this season would have been welcome. The “Connecting the Galaxy” feature is fun, and clearly aimed at introducing younger fans to the larger Star Wars galaxy. It’s a rapid fire trip through some of the Easter Eggs and nods to Star Wars history, both on and off screen, seen this season. Some are pretty obvious, like Ezra picking up a green crossguard lightsaber being a nod to Kylo Ren’s lightsaber in The Force Awakens. It was also nice to see that Ralph McQuarrie was mentioned in the featurette, given that the look of the show is so heavily inspired by his work. Some other quick thoughts on the blu-ray. I wish there was a way to watch the two part episodes, like “The Siege of Lothal” and “Twilight of the Apprentice”, as one 44-minute episode without the credits and titles in between the episodes. The episodes aired this way, so it would be nice to relive them this way two. A fun Easter Egg I found (though I hesitate to call it that because it’s not that hard to find on your own) is that if you select “Sneak Peaks” on the first disc, you get the Rogue One: A Star Wars Story teaser! Even though it’s been available online since April, it’s still nice to see it in blu-ray quality. The main attraction with a box set like this is the episodes, and they do look great on blu-ray--not to mention the ability to binge watch them enhanced my viewing experience. 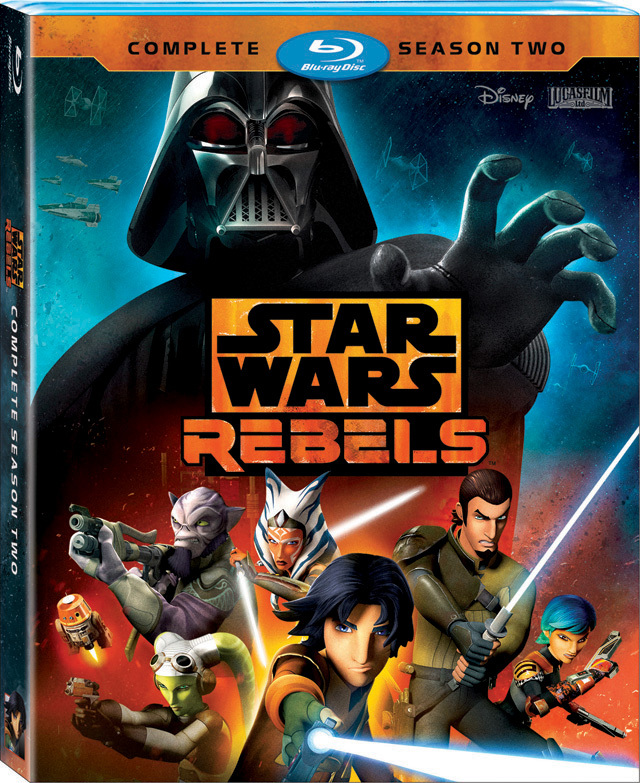 For that reason alone Star Wars Rebels fans will enjoy this box set, even if the bonus features are lacking.